Cleeve Apartment is part of a complex of charming country cottages in a beautiful setting of the Avill Valley between Dunster and Timberscombe, within the Exmoor National Park. This property is well-suited to couples or singles, as it has one bedroom with twin beds. 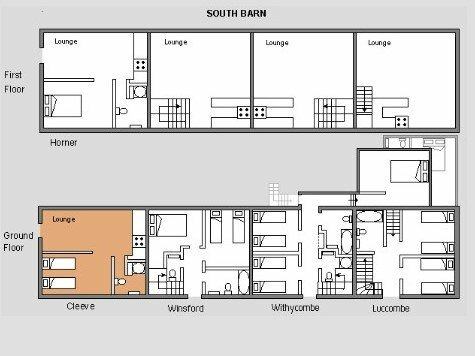 Cleeve Apartment is situated at the west end of The South Barn on the ground level. It is reached via a patio area where you can sit and relax outside. It has lovely views across the valley. Entering Cleeve Apartment from the patio area, you go straight into the open-plan lounge/diner. 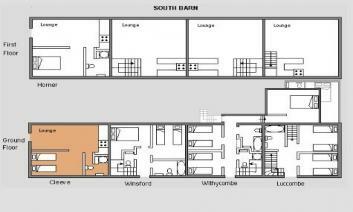 The kitchen is on the far side and the twin bedroom is to your right. Here also is a small corridor leading to the shower room (no bath). Yvonne didn't write a comment. This is a lovely groundfloor appartment. Cosily furnished and perfectly adequate for 2 people and a dog. The complexis small and are sympathetically restored barns. Good for a few people as you have your own small outdoor space for eating and just enjoying the secenery. 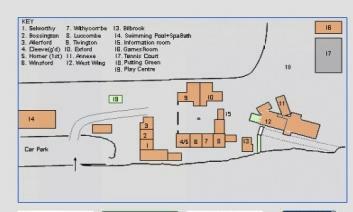 However, for larger parties the complex is set around a pretty courtyard where you can bbq and enjoy being with others. Richard is a friendly and helpful host. The 'Information Room' is stacked with leaflets etc on activities. Plenty of kiddies dvds and books as well as some for adults. The heated pool and, sauna are great and, in our experience, if you visit early evening when the children are normally being fed etc it's possible to have the place to yourself. Very clean and spacey changing rooms. A fantastic base for exploring country or coast. Great value for money. Will return one day! Michael didn't write a comment. Amazing facilities and a very amenable and laid back host.